In the discussion, a user talks about a slow creep in RA (with some variance in DEC). Sounds pretty familiar! In the thread, a person linked to a review done by Craig Stark (of PHD guiding fame) where he looks at the Borg 50mm guidescope using the XY stage. http://www.sciencecenter.net/hutech/borg/guidescopes/attnov08.pdf In it, he describes a test to determine differential flexure where he images a distant daytime object at one extreme of the scope position, then slews to the other side and images again. The idea is that the differential flexure between the two imaging cameras would create a double image. How well did the flocking work? Last week during the clear nights, I was able to get some images of the night sky from the back yard. I was taking some pictures near M53. There is a somewhat bright star nearby, Diadem, aka HIP 64241 or 42-Alpha Comae Berenices. This star is a magnitude 4 star, somewhat less bright than other stars that were giving me issues. Here is an image of the stack with a simple stretch in PixInsight. Note the diffuse, linear nature of the flare. Here's a view of how it resides outside of the field of view of the frame. Note that image has been linked in TheSkyX and the white line shows the frame of the platesolve. Also note the distance tool showing a relative distance from the star to the brightest portion of the flare. The value is about 7' 57''. Lastly, I have a screen capture of the CCDWare website tool that shows a calculation for dust donuts. I've added the calculation of what I see as the brightest part of the flare. Numbers for the Pentax K10D are 6um pixel size, the SV4 scope is f6.4, and the distance of 8 arc minutes is about 250 pixels at the resolution of 1.9 arc seconds/pixel of this setup. Interesting to note that the CCDWare tool suggests that the flare may be originating at 9.6 mm in front of the sensor - or at 19mm if I recalculate assuming that the 8 arc minutes is actually the radius and not the diameter. 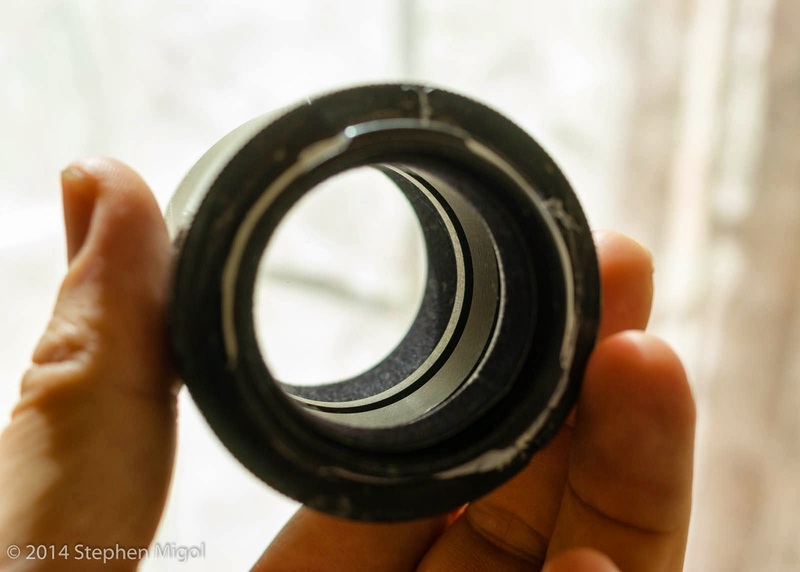 As the Pentax camera has a flange distance of 46 mm, this puts the reflection within the mirror box of the DSLR. I have looked at the camera in the past and wondered if glinting could occur off some of the edges, specifically around the light meter. The box sides are baffled with ridges but there are some metal panels that extend into the light path a bit. I wonder if the edges of these are fully blackened. I will try to cut some pieces of flocking paper and place them along the sides of the box. I would like to check the trace to ensure that the calculations above are correct. I'll have to remember my trigonomy. It's important to note that for this stack, I did NOT use the extended hood. Rather, any changes in flare control came from flocking inside the flattener. I did use a longer hood on other image sequences and felt that they were causing issues with star shapes and diffraction spikes so I abandoned them in favor of running the dew heater more aggressively. EDIT: The more I think about this flare, the less I believe that it's coming from reflection and more likely from either dirt or condensation on the optics. Looking at TheSkyX, the star is just off of the sensor. It's possible that the relctions are coming from components on the board nearby as well. It's just too close to block even with a longer hood. I think the current issue with the stacked Peltier devices is that once they cool, they start generating too much of their own heat. This becomes a problem and it keeps the camera from cooling further. Also, the hot air from the heatsink fan blows onto the camera body. 1. Put a physical barrier between the camera body and the airflow. 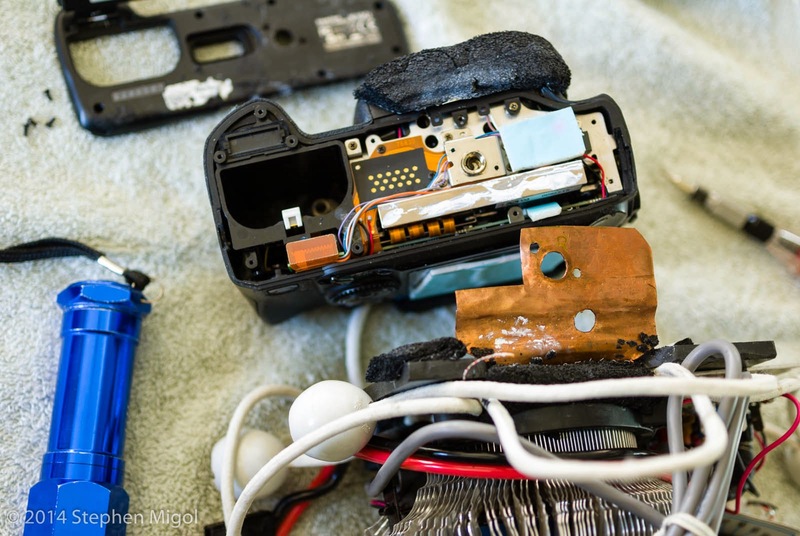 I'm wrapping the camera in an old sock to act as a thermal blanket. If this works, then I can use adhesive material and wrap the closed-cell foam tape I have around the critical bits. Once stabilized, I'm seeing that the bottom of the camera is 55.4F as measured under the thermal layer. I'll check it periodically and see how it changes. 2. I've ordered replacement thermistors for the controller. Once I have these in hand, I'll put the sensor into the camera at the place where the finger touches the chassis. That will give some information about the performance of the cooling and may be able to throttle the devices, letting them work less hard and thus not heat up as much. I would have preferred to find the device locally, but I was not able to find it online at Frys or Halted. 3. Still bench testing to see if the camera holds the warm temperature or if it doesn't change. The new dark data is useful as there are hot pixels that have developed over time. Over the coming months I'll be adding more darks to the library. I've looked at the data from the darks of the same EXIF temperature measured last August vs yesterday. Aside from the hot pixel outliers, the range is still very similar across the whole frame. In other words, much of this effort hasn't changed things. I stacked the Tellurex C2-30-1503 and Tellurex C2-30-1505 devices as noted. Just needed to pull out the old pad of paper that was supporting the copper plate and add some extra foam insulation to properly close the area around the parts. Ideally, I should be using some chemical foam, but that's pretty messy stuff and I'm not finished yet. No pictures of the assembly this time, I was working quickly. My math was off with figuring out what the amp draw of the two devices would be stacked. With 12V applied, the draw is 5.5 to 5.7 A. This is only about 1 A more than the 1505 by itself. I believe that the difference is because the pull and temperature is derating the resistance of the devices. Handling 6A is not a small amount of power for use in the field. I'm considering what it will take to provide this much juice to the scope. I'll play with putting a splitter closer to the battery/car vs putting it at the Kendrick power distribution box. Running two cords should give the effect of less cable resistance. The only part that really complains about low voltage are the dew heaters. If necessary, I'll put a voltage regulator on it to help support them They draw 1.1 A under full load so it shouldn't be much of an issue. So far, the air based heat sink seems to be keeping up with the upgraded power requirements. I'm testing it on the desktop and I can feel that the tabletop is warm. That shows me that there's quite a bit of heat being moved. I looked into some closed-circuit water cooling devices to see if they would be good for this setup. While the concept is good, the hoses are too short for my use. Most are one foot to 18 inches - great for use inside a computer case, horrible for trying to route hoses from the back of a camera on a telescope. If I need to go this way, I'll roll my own system as I'll either need 2 feet of hoses to mount the system on top of the scope (piggyback style), 6 feet to mount it at the tripod head, and 10 feet to go all the way to the ground. After all the testing on the desktop and again in the refrigerator, I'm disappointed that the EXIF temperatures did not drop below 17C. I believe that either I've misconfigured the TEC devices OR there's not enough watts pulled out of the camera OR that the EXIF sensor is no where near the cold finger. Best I can do at this time is continue to take darks and compare with earlier configurations. As another followup, I see the reason why the PWM controller stopped working. Apparently the thermistor has gone open. I'll get another to replace it and when I can, I'll put it into the system. May be able to wire up the assembly with the new stacked devices to better control the power needs. Left the car unlocked and my toolbox with scopestuff was taken overnight. They made away with a 41mm Panoptic, 40mm Scopetronix Maxview (2inch version), 3-6mm Nagler Zoom, a spare Losmandy Gemini motor, IDAS HEUIB II 52mm filter, IDAS LPS P2 48mm filter, metric hex set, a baggie of half-height 6mm nuts, plus my supply of 6mm and 1/4-20 socket head screws. I had a backup stash of lithium coin batteries plus a bunch of dead 9V. A wood-inlaid compass was also in the box as well as the tiny set of hex wrenches for aligning the reticle for the Losmandy polar scope. And my nice LED red flashlight. Surprisingly, they didn't take the 50' extension cord nor the two sets of binoculars they had to move to take the toolbox. Likely they'd get just a few bucks from the fence for the whole kit. It's a shame, really. I'll be looking into what coverage the insurances might have. Rather annoying as I had been considering selling the eyepieces as I don't do visual except on outreach nights. Also, I was hoping to do some maintenance on the scope this week as a followup to the work I'd done last week. As I've noted in earlier posts, off axis flare is a real thing that I've started to address. I believe that the reason why flare wasn't noticed before was that my efforts with picture taking was mostly on brighter objects and my poor methods of calibration wasn't pushing the exposures enough to see the flare. Now that I'm aware of it, I can see it more readily. I've been marginally successful with controlling it with some flocking efforts, mostly concentrating on the bright anodized components in the feathertouch focuser. At the latest project, I noticed that the flare was coming from an area about 1.3 degrees from the edge of the frame. This got me to think about how to better flock the components. I added some rings of felting in the flattener. See these photos for a view of what I did. Note how I've added flocking to the T42/Kmount ring. I don't expect there to be much possibility of glinting on these elements, but it doesn't hurt to control it. I'm expecting a certain amount of fiber shedding. I made the effort to drag some tape on the felting to pull off loose threads. Hopefully this will keep the shedding to a minimum. As the photos show, there's some exposed metal between the elements of the flattener. These may reflect light if they are exposed at the proper angle. I checked with Vic of Stellarvue and his comment was that the retaining ring should be just finger tight. Well, mine is gummed up from previous experiments with adhesive flocking. Not going to be able to get into this spot. Instead, I'm going after the idea of using a longer hood to control off-axis light. The idea is that by keeping the sensor from seeing the bright stars, it's unlikely to have as much of an effect. I was looking at the potential of a custom lens hood like the ones on this site. Based on some math provided by the HOODCALC.xls spreadsheet that I found on the Pentax Forum, I've found that the hood length for the APS-C sized camera should be about 450-500mm long. That's pretty big. Up to now, I've been using a foam paper hood rolled around the existing dew shield to extend the structure. Based on the math, I'd need to add another 6 inches or more to the end of this structure. I played with adding different shapes to the foam paper recently. I tried rolling it up inside the dew shield. This works well but it does raise the challenge of repeatability. Plus, it shows the fact that a long extension of material will sag under its own weight. For anything that's going to be permanent, I'll need something that's light, won't sag, and fairly durable. I've been thinking about rolled aluminum. Advantage is that I could get it made from something fairly sturdy and not worry about crushing it. Disadvantage is cost. What remains to be seen is how this extended tube will impact piggyback shots. I ruined a few film shots back at Calstar because the hood extended into the frame. I'd like to avoid this happening in the future, too. For now, I can use the newly rolled up foam paper that has some carefully placed velcro tabs. It may serve the purpose well. A possible concept that I may return to try would be to cut a rectangular mask out of some cardstock and insert this into the dewshield. If I put it right at the objective, it could mask the offending areas pretty easily. This would allow a shorter hood to be used with minimal changes. I'll do some math and cut one as I have the chance. Another exercise that I completed today was getting back into the camera. I'd been suspecting that the cold finger wasn't making good contact with the chassis of the camera. Finally tore it apart and checked. Sure enough, the old thermal paste tells an obvious tale. The old material was barely touching. To remedy this situation, I bent the copper to fit a bit tighter. I also inserted a slip of foam paper to apply some slight pressure as well as thermally insulate some of these parts. Lastly, I moved the thermal probe to a better place inside the assembly where it can make contact between the finger and the chassis. In my testing afterwards, the thermistor controller showed no drop in temperature below 10C. I base this measurement by turning the power controller down until it stops pulling a high amp load. Ambient temperatures were 22C. EXIF temperature was 17C. I also measured the temperatures on the camera body at a few different places. This tells me that wrapping the camera in a thermal blanket is important. I'd already inserted a piece of foam paper between the dovetail and the camera body. This should help control unwanted heat entry to the camera. On further testing, I mounted the camera to the telescope, wrapped the camera body in thermal layers, and set it up to do a run of darks while in the shed. The shed temps are approaching 28C and surprisingly, the thermistor controller is suggesting the sensor is -15C. I'll need to check later to see what the EXIF temperatures are. If this works well, then I can expect very low noise in the field going forward! Returning to this post after some time. The shed experiment was inconclusive. EXIF temperatures started at 18C and went up to 25C before the voltage drop from the outside power to the 12V converter was too much. Will have to try again and see what I get using a different cabling situation, more like the way the car setup where the 12V is provided at the start of the extension cord. An update from Weather West suggests that the rain-blocking ridge may return. While I'm not terribly happy with the prospect of dry conditions being that we're in a drought, I'm bummed that the clear skies comes right when the moon is moving into full. Maybe it will give me the chance to check the system for flare control. Ghost of Cassiopeia (IC 59 and IC 63) at Calstar 2013, a photo by S Migol on Flickr. This area is a complex of dust near the bright star Navi in Cassiopeia. The nebula glows with a combination of emission and reflection, giving a reddish and blueish white color. The whole complex of IC 59 and IC 63 also are in the Sharpless Catalog as Sh2-185. Taken over two days while at Calstar 2013 in October. Most data was collected on the first night after I'd done polar alignment and while I was struggling with polar alignment and guiding of the GM8 for film work. The rest of the data was gathered piece-meal as I had shut down the GM8 and went piggyback for the film camera. No light pollution filter, just used the B+W 486 UV/IR filter. For a time I was using this filter to control NIR and UV on the full spectrum camera to control what I thought was out of focus light causing problems. 10 subexposures at 1200 seconds each giving 3 hours and 20 minutes of integration time. Guiding and calibration with Maxim DL. Processed with PixInsight: crop, DBE, masked stretch script, histogram stretch to reset black point, masked use of SCNR to control green, MT with a mask for brightest areas, finally unmasked curves to boost contrast a bit. I have not taken a similar image recently that features such a bright star. I'm curious what the recent centering and alignment and flocking work I've been doing will change the behavior of the system. Field of view ..... 1d 52' 44.8" x 1d 17' 10.2"